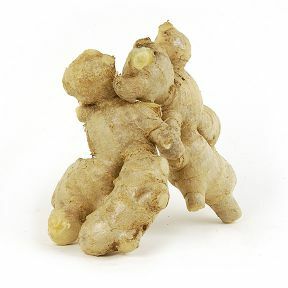 Ginger, a rhizome, is a golden, digit-like underground stem with a sweet yet pungent odor and flavor. Once peeled, ginger’s meat is light-brown and moist. Ginger has become a common ingredient in many of the world’s cuisines. For example, Ginger is used by Japanese Sushi chefs as a garnish to their traditional Sushi dishes. The Japanese assert that it extremely effective in cleansing the palette after the strong, pungent flavors associated with Sushi dishes. Ginger not only tastes good, it’s also believed to have healing/medicinal properties, and people sometimes use it to soothe their upset stomachs and boost their energy. Ground ginger isn’t a good substitute for fresh, but dried whole ginger will work in a pinch, as will the minced or puréed ginger that’s sold in jars. Names: Ginger root, Geung, Khing, Shoga. Source: Asia, South America, and the United States. Handling: Stored at approximately 40°F in relatively dry environment. Do not mist.